Lassa fever or Lassa hemorrhagic fever (LHF) is an acute viral hemorrhagic fever caused by the Lassa virus and first described in 1969 in the town of Lassa, in Borno State, Nigeria. Lassa fever is a member of the Arenaviridae virus family. Similar to ebola, clinical cases of the disease had been known for over a decade but had not been connected with a viral pathogen. Neighboring countries are also at risk due to the animal vector for Lassa virus. The animal is the, 'multimammate rat,' or, 'Mastomys natalensis,' which is distributed throughout the region as a whole. In the year 2009, the first case from Mali was reported in a traveler who was living in southern Mali. Ghana reported its first cases in the year 2011. Isolated cases have been reported in Cote d'Ivoire and Burkina Faso. There is also seismologic evidence of Lassa virus infection in Benin and Tongo. Around 20% of infected people; however, the disease might progress to more serious symptoms that include hemorrhaging of the person's eyes, gums, or nose - repeated vomiting, respiratory distress, pain in the back, chest and abdomen, facial swelling and shock. Neurological issues have also been described in relation to Lassa fever, to include tremors, hearing loss and encephalitis. An infected person may die within two weeks of their initial symptoms because of multi-organ failure. The most common complication of Lassa fever is deafness. Different degrees of deafness happen in around one-third of those who become infected. In many cases, the hearing loss is permanent. The severity of the disease does not affect this particular complication; deafness might develop in mild as well as severe cases. Between 15-20% of people who are hospitalized for Lassa fever die from the illness. Only 1% of all Lassa virus infections; however, result in the person's death. The death rates for women in the third trimester of pregnancy are exceptionally high. Spontaneous abortion is a very serious complication of the infection; an estimated 95% mortality rate in fetuses of infected mothers is an alarm sounding off. Due to the fact that the symptoms of Lassa fever are so nonspecific and varied, clinical diagnosis is often times difficult. Lassa fever is also associated with occasional epidemics. During these epidemics, the fatality rate may reach as high as 50% in people who become hospitalized. Lassa fever is most often diagnosed through the use of, 'enzyme-linked immunosorbent serologic assays (ELISA), which detect IgM and IgG antibodies as well as Lassa antigen. Reverse transcription-polymerase chain reaction (RT-PCR) may be used in diagnosing people who are in the early stage of the disease. The Lassa virus itself may be cultured in 7-10 days, yet the procedure should only be performed in a high containment laboratory with good laboratory practices. Immunohistochemistry, performed on formalin-fixed tissue specimens, might be used to make a post-mortem diagnosis. Primary transmission of the Lassa virus from its host to people may be prevented by avoiding contact with Mastomys rats - particularly in the geographic areas where outbreaks happen. Putting food away in rat-proof containers and keeping your home clean help with discouraging rats from entering your home. Using these rats as a source of food is definitely not recommended. Trapping around and in homes may help to reduce rat populations. Yet the wide distribution of Mastomys rats in Africa makes complete control of these rats impractical. While providing care for people with Lassa fever, further transmission of the disease through person-to-person contact or other routes may be avoided by taking preventative precautions against contact with secretions from infected persons called, 'VHG isolation precautions,' or barrier nursing methods. The precautions include wearing protective clothing such as masks, gowns, gloves and goggles; using infection control measures such as the sterilization of equipment. It is vital to isolate infected people from contact with unprotected persons until the disease has run its course. In addition, educating people who live in high-risk areas about ways to lower the rat populations in their homes will help to control and prevent Lassa fever. Other challenges include the development of quicker diagnostic tests and increasing the availability of the one drug known for treatment of Lassa fever - ribavirin. Research is currently being performed in regards to the development of a vaccine for the illness. 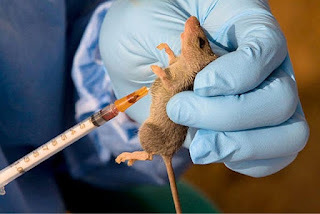 While most humans are infected either from contact with an infected rat or inhalation of air contaminated with rat excretions, like other hemorrhagic fevers, Lassa fever can be transmitted directly from one human to another. It can be contracted through direct contact with infected human blood excretions and secretions, including through sexual contact. No evidence of airborne transmission person-to-person is seen. Transmission through breast milk has also been observed.